Piloten zijn cool. Ze vliegen de hele wereld over en trekken altijd de aandacht van de dames. Wat is er nu beter dan een piloot, zul je je afvragen. Een vrouwelijke piloot! Maria Fagerström is dan ons antwoord. 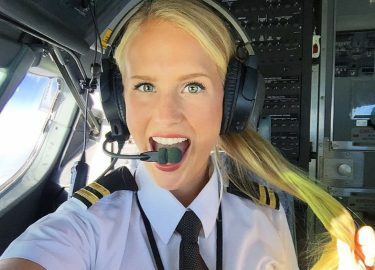 Deze knappe, 24-jarige pilote uit Zweden steelt de show en is eigenlijk de perfecte vrouw. Maria is niet alleen dol op vliegen, ze houdt ook van sporten, reizen en yoga. Deze dame zal nog wel even in je gedachten blijven zweven. Getting up bright and early tomorrow morning to fly back to Tenerife ?? This is how excited I am ?? Wish you all a good night sleep from Sweden ??? You can't go through your whole life trying to please everyone else but you. Starting from today I will put my own happiness first. I will do all the things that makes my heart happy, regardless of what others may say (within reason of course ?) Good vibes only ? This is how I'd like to spend all my winter days ⛄️? Happy new year everyone!? I'm super excited for this year to come!! So many adventures ahead ? Tie is a bit crooked and wind is blowing like crazy but I'm happy as ever!! Because I finally got rid of my cold and feeling great ? New exciting adventures ahead ?? Flight bag ✔️ Backpack ✔️ Uniform ✔️ GoPro ✔️ All ready – let's fly ✌️? Goodnight people – new exciting day tomorrow ? I got pants ? I got a pineapple ?I got pineapple pants ?? ⠀⠀⠀⠀⠀⠀ ⠀⠀⠀⠀⠀⠀ Get yours at @flexilexi_fitness and we can be twins ? The necklace was a gift from my beautiful friend @emeleonora ? I always wear some kind of jewelry, also when flying – it makes me feel more feminine in a manly pilot uniform ?? Who else is stretching today? (if you haven't yet, this is your reminder!! ?Even 10min will make a world of difference to your body! ??) ⠀⠀ ⠀⠀⠀⠀⠀ Wearing my favorite leggings from @flexilexi_fitness ? Waking up early to see the sunrise is one of my favorite things to do. How beautiful isn't the sky with all it's colors? Gaaaah magic!! ? Just dropped of my besties @flymeyoga & @pilotmaria at the airport – always hard to say goodbye ? We will see each other soon again, I'm sure of it ?? Now some relaxing before next adventure ?? Up early with the sunrise to practice yoga ? Love living this close to the ocean ?? ⠀⠀⠀ ⠀ Wearing my favorite leggings by @flexilexi_fitness ? Just here enjoying my morning coffee ? Real life: Seconds from disaster.. Cup was so full I ended up spilling coffee all over the floor ??? Just walking casually in the middle of the road ?? Not really.. Took us a good amount of time getting this picture running back and forth not trying to get hit by cars rushing by ? But look at that scenery though!! Again, my bestie and awesome photographer @emeleonora is behind the camera ? Time to recharge after the weekend ? ?